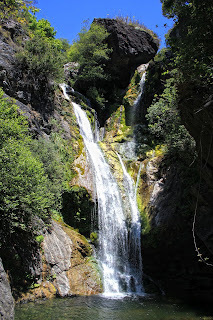 Salmon Creek Falls is the best waterfall on the Big Sur Coast. McWay Falls would be a close second. If you’re planning a trip up the coast on Highway 1, it’s pretty much mandatory that you add it to your itinerary. The falls are over 120 feet tall and they flow consistently all year round, even during long periods of drought when most of the other falls have dried up. No other waterfall in Big Sur flows with a higher volume of water. In fact, you probably won’t find a mightier waterfall on the entire coast of Southern California. The hike from the highway to the base of falls takes less than ten minutes. Your morbidly obese grandmother probably won’t make it up the trail, but the it’s likely suitable for everyone else. If you’re an adventurer like me, you’re going to want to climb to the top of Salmon Creek Falls and explore the cave at the precipice. The trail from the base to the top is pretty perilous, but worth the effort in my opinion. You have to weave your way up the right side of the steep canyon, grasping at saplings, roots, poison ivy, and whatever else to keep from slipping on the loose gravel and mud. Once you reach the top of the falls, you can rock-hop across the river slip into the cave from a hidden opening on the back side. Only attempt this if the water level is low and he cave is dry. If you slip on the lip, it’ll be the last mistake you make. Salmon Creek falls is located on a hairpin turn 18 miles North of San Simeon California (Hearst Castle). You won’t be able to see the falls until you're almost past them, so look for cars parked on the side of the highway or plug the mileage into your GPS. The pull-out area on the side of the highway can get pretty crowded, so try your best to avoid running over any tourists.